Assessment 1: Literature Review Topic: The Rise Of Television In The UK Sources Used: - 'An Introductory History To British Broadcasting' Andrew Crisell, 1997 - 'Television' Williams, 1974 - 'The Television Studies Book' Geraghty and Lusted - 'Journal' The rise of television in the UK has been extensively discussed and contested by media authors and critics, with the different interpretations and disciplines forming a range of comparable source material to gain a personal understanding and perspective from. In order to develop a more effective analysis it was requisite that I investigated into a broad scope of sources that I could then utilize to compare with one another, eventually shaping a fuller view of the matter. When first venturing out on my investigative process I was aware that I wanted a variety of sources inclusive of books, journals and articles that would allow me to forge clear distinctions between the different responses helping me achieve my aim of gaining a well rounded viewpoint. I made an immediate decision to avoid 'textbook' style sources that would have been written directly for student study, as I believed items such as these would provoke limited detail and insightfulness of views and ideas. After using the library, advised book list, and internet as my major search tools I managed to collect a series of ...read more. was initially a very difficult much slower process, as there was no one section that was directly or solely dedicated to it. The general information given, although was highly insightful, did at times take a rather random form, for example within the chapter 'Institutions Of The Technology', where Williams on a few occasions leads off the subject, at one point overly discussing governmental intervention and the debates surrounding it as a separate issue. In response to this problem, I found with constant referral to my topic area in mind, I was only gathering the most appropriate data that was requisite to my research and understanding. On a more positive note in relation to the structure of the book, the given aims at the start of each major chapter made understanding the authors intentions a easier process, knowing exactly what ideas and subjects were going to be discussed and explored. The linguistic framework used throughout this source is as in source 1 of a striahgtforward and consistant style aiding an easier and more digestable undertstanding. However, on a more critical note of this aspect in order for me to develop my level of skill and professionism I would now like to be faced with a more challenging use of language where technical vocabularly is used on a more frequent basis. ...read more. However, when read closely, it became clear that each author specialised in their chosen subjects and presented very unbiased information, stating facts and figures with mere suggestions as to why certain events or trends might have taken place in history. 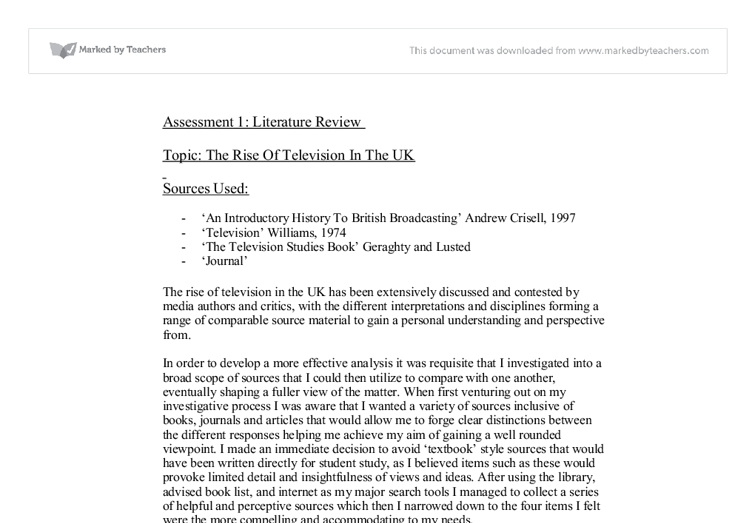 As some of the detail was at times more complex to absorb I found that the precise evaluations given at the end were extremely helpful in reminding me of the major points The main areas that I focussed on within the source were of the history of televsion in the UK and in the US. This is because American television production in terms of development shares the greatest similarity to the UK, thereby making my understanding of the history and context rather straightforward. Although I only covered the history of television across the world in brief detail I found the information given really complelling and would aim to further my understanding in more depth. 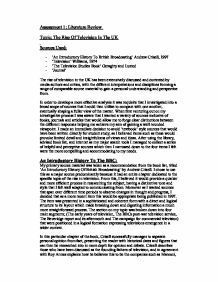 As a research source into the rise in television in the uk, this document was really benefitial in providing me with a broad and varied background that ultimatley helped shape my overall understanding of the topic. I believe by selecting a source such as this, I was looking at the 'bigger picure' of my subject to be able now to make more formal judements in a wider context. ...read more. This alone is an important development in television technology because it enabled us, for the first time, to use electric currents to send and retrieve images and 'it could be said that the origins of television date back to the discovery of electricity by Volte and Galvani' (Sinclair, I, 1995). How powerful is the Media in British Politics? made good television, what was rarely shown was the scenes of peaceful protest. This resulted in a lot of anti (Tory) government sentiment at the time. An eyewitness of the strikes who was later interviewed for Scottish television commented: "when I saw the TV pictures I thought it was terrible because I thought it was really violent. It might be suggested that not only the fact that Deerfield's patriotic manners are due to the impact the military has had on his character, but also that it is representative of the first stage of the director's presentation of how negatively the military affects our lives. Chack'n Pop 4. Choplifter 5. Congo Bongo 6. Flicky 7. Galaga 8. H.E.R.O. 9. Hyper Sports 10. Lode Runner All these games are on the SG-1000 most are black and white. This is one of the world's best game consoles at its time. While doing so it also gives us the main points and arguments of the documentary; explaining his aims and actions. It gives focus to his arguments; he tells us what we are looking at and directs our focus rather than only giving us unaccompanied visual images.